Tag line: "ON THE SCREEN...America's Favorite Hero!" As I mentioned in my write-up of 1978’s Superman, Christopher Reeve will always be my favorite Man of Steel. That said, I used to love watching reruns of the '50s television show The Adventures of Superman. 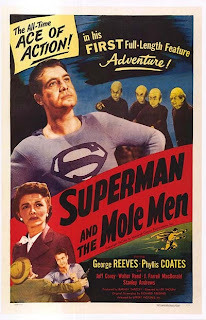 Sure, there were plenty of episodes when the so-called “adventure” were nothing to write home about, but star George Reeves, who would play Superman throughout the run of the series, had a confidence about him that I always found appealing. Produced as a pilot for the TV series, 1951’s Superman and the Mole-Men marked the first time Reeves donned the red cape. In the movie, his alter ego, newspaperman Clark Kent, accompanies fellow reporter Lois Lane [Phyllis Coates] to the small town of Silsby, home of the world’s deepest oil well, where something very unusual is about to happen. It seems the well, which recently drilled to a depth of over 3,000 feet, broke through the earth’s crust and into the dwelling of a race of tiny, mole-like humanoids, which have now made their way to the surface. Far from welcoming these visitors with open arms, the citizens of Silsby decide it’s best to kill the Mole-Men on sight. Clark Kent tries to talk some sense into the angry mob pursuing the creatures, but when all else fails, it’s Superman to the rescue! Story-wise, not much happens in Superman and the Mole-Men; the Mole-men climb to the surface, where they’re harassed by the locals and protected by Superman. What makes it such an interesting watch, however, is George Reeves. His combination of physical strength and simple decency make him believable as the Man of Steel, but what’s really interesting is how he portrayed Superman’s alter-ego, Clark Kent. As played by Christopher Reeve, Kent was a bumbling fool, good for a few laughs and not much else. Reeves, however, brings the same strength and intelligence he displays as Superman to the role of Kent, making the reporter a take-charge kind of guy who’s always on the side of right. In essence, Reeves' Kent is an extension of Superman, a “mild-mannered reporter” who’s plenty brave when needed. Unfortunately, Reeves' career stalled as a result of The Adventures of Superman. Typecast in the role of the Man of Steel, he wasn't able to get much work outside the show, which more than likely contributed to his suicide in 1959 [for more on his story, check out the fascinating 2006 film, Hollywoodland, starring Ben Affleck). A natural hero, it’s a shame George Reeves didn’t get the chance to play a few more of them.